Heavy cruiser Admiral Hipper on trials, view from starboard. Note the near vertical bow was late 1939 and the strait-topped funnel; she was rebuilt with an "Atlantic bow" and an angled funnel cap in early 1940. 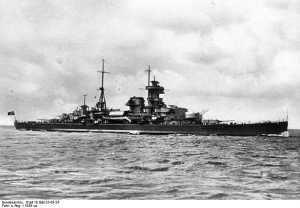 The Kriegsmarine was the name of the German Navy between 1935 and 1945, during the Third Reich. The Treaty of Versailles had only permitted Germany a small navy. While it affected all of Germany's armed forces; it most severely limited the Imperial Navy. British fear of the German threat to its maritime supremacy dictated that the Reichsmarine, (as Imperial German Navy became known in 1921) must be reduced to a flotilla of coastal craft, tug-boats, and obsolete, Dreadnought-era battleships. And even within Germany in the 1920s, there was some animus towards the Navy. Its policy of unrestricted submarine warfare was seen as a primary cause for the harsh terms of the Treaty of Versailles and the scuttling of the fleet at Scapa Flow as a mistake. In 1928 Erich Raeder, an apolitical career sailor and First World War veteran, took the helm at the Reichsmarine. First, Raeder had to persuade the German leadership that a Navy was important. After gaining General Hindenburg's support, Raeder secured the funds for his naval rebuilding program. Some small-scale, and secret, research and development had been going on even before Raeder's appointment, but with additional funds this accelerated. The secret military research was carried out under the aegis of foreign "projects", with many new tanks, aircraft and submarines being joint-ventured in countries like Finland, Spain, and the still-ostracized Soviet Union. While Versailles had forbidden the Reichsmarine to have any U-boats at all, submarine research was carried out with a Dutch firm, Ingenieurskantoor voor Scheepsbouw (IvS), a front organization for Krupp. When Hitler came to power in 1933, Germany soon began to re-arm and ignore Treaty restrictions. 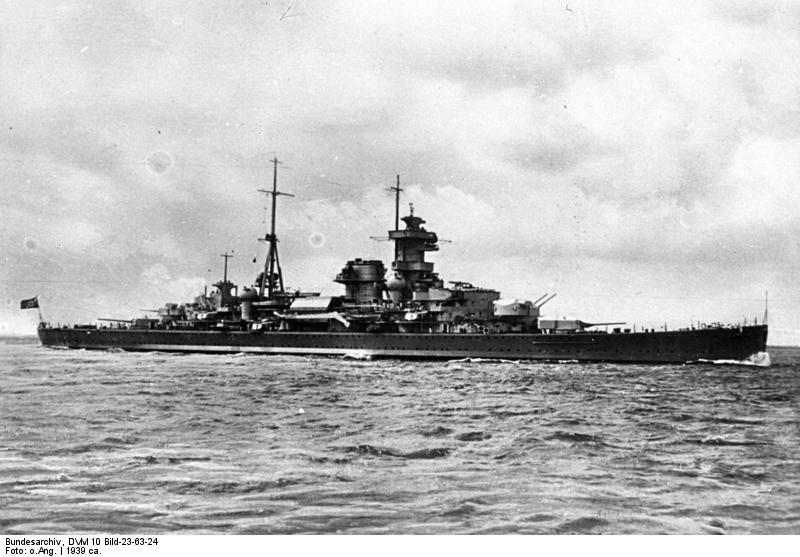 The Reichsmarine was renamed the Kriegsmarine, or "Combat Navy", and production of new ships accelerated. Hitler now saw a Navy as vital to his vision of a reinvigorated, powerful Germany - and supported Raeder's development program. The 1935 Anglo-German Naval Agreement revised upwards Germany's permitted navy. 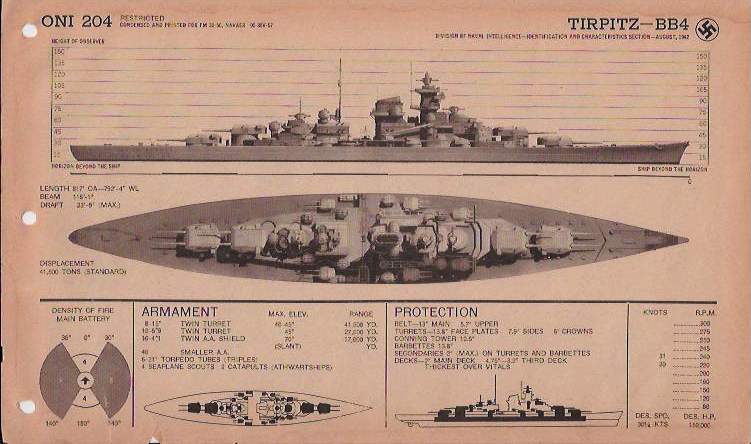 She could build the equivalent of 35% of British surface ship tonnage and 45% of British submarine tonnage; battleships were capped at 35,000 tons. While permitting German submarines under this treaty seemed to be a significant change from the Versailles prohibition, in fact, it was minor, as the British had relatively few submarines. Following the Sudetenland crisis of 1938, Germany no longer even pretended to follow any naval treaty limitations. Before this time, German planners had not foreseen any early war with Great Britain or any other major naval power, and naval construction proceeded with potential Continental adversaries like Poland and France in mind. 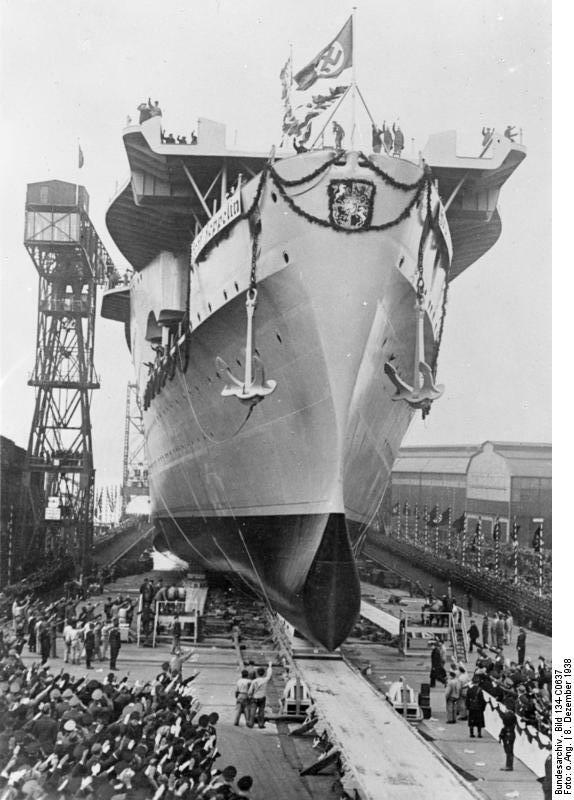 In 1938, German naval planners drew up Plan Z, a construction program that envisaged an 800-ship navy, built up over the next eight years (1939-1947). It would have included 10 battleships and battlecruisers, 4 aircraft carriers, 15 "pocket" battleships (Panzerschiffe), 5 heavy cruisers, 44 light cruisers, 158 destroyers and torpedo boats, 249 u-boats, many smaller craft, and over 200,000 naval personnel. Even while war with Great Britain seemed a possibility, in the late Thirties, Germany still thought that possibility lay may years in the future, thus Plan Z's long term. As build-up of the German land and air forces called for substantial effort and resources, Plan Z was not very far along when World War II began. It had just started in early 1939, with two H-class battleships. In September, the navy still only had 78,000 sailors; it was not at all prepared for a major role in the war. In 1939-40, as Germany expected a quick victory by land, Plan Z was put on the back burner, and its resources diverted to the construction of U-boats. 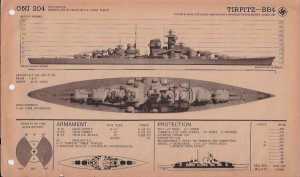 At the start of the war, the Kriegsmarine consisted of just 11 capital ships, with 7 building. 21 destroyers and 57 U-boats, mostly suited for coastal operations, supported the fleet. The German Navy achieved some notable early victories, like the invasion of Norway and the destruction of a few major British ships, but the sinking of the Bismarck in May 1941 signalled the end of these limited successes. From this time, the Germans dared not risk their capital ships and the paucity of surface ships of any class made every loss more important. Indeed, their most successful operation from 1942-onwards was the famed "Channel Dash," which consisted of speeding two battle cruisers and a cruiser from the Atlantic through the English Channel to the relative safety of the North Sea ports. The U-boats continued operating successfully until mid 1943 when the Allies' air superiority, convoy system, and technological advances made U-boat operations unprofitable. By the end of the war, only two of the major Kriegsmarine ships were still operational, all other were sunk, either during their operations or destroyed during the last months and weeks of the war in their bases. This is not an online History of all German Naval Operations in World War Two, merely a summary and some images of ships.